One of the classic dishes from Brittany and Normandy, and straightforward to prepare. Sometimes, instead of using chicken stock, a good Normandy cider can be used; when this is done, the dish become Poulet au Cidre. Try it both ways to see which you prefer. · 1.5kg of jointed chicken, although trimmed thighs work perfectly well. · 2 large dessert apples, such as Cox's Orange Pippin, Golden Delicious, Granny Smiths, Braeburn, Gala. 1. Peel and core the apples. Finely chop half of one, and cut the rest into wedges. 2. Heat half the butter in a large frying pan, then add the chicken pieces, skin side down, and cook until golden. Turn over and cook for another 5 minutes or so, then lift the chicken out of the pan, and pour away the fat from the pan. 3. Heat a tbsp of butter in the same pan, add the onion, celery and chopped apple, and fry over a moderate heat for 5 minutes, but do not brown. 4. Remove the pan from the heat, and sprinkle the flour over the vegetables and apple, and stir in. Add the Calvados (brandy) and return to the heat. 5. Gradually stir in the chicken stock (or cider) and bring to the boil. Return the chicken to the pan, cover and simmer gently for 15 minutes, or until the chicken is tender and cooked through. 6. Meanwhile, heat the remaining butter in a small frying pan. 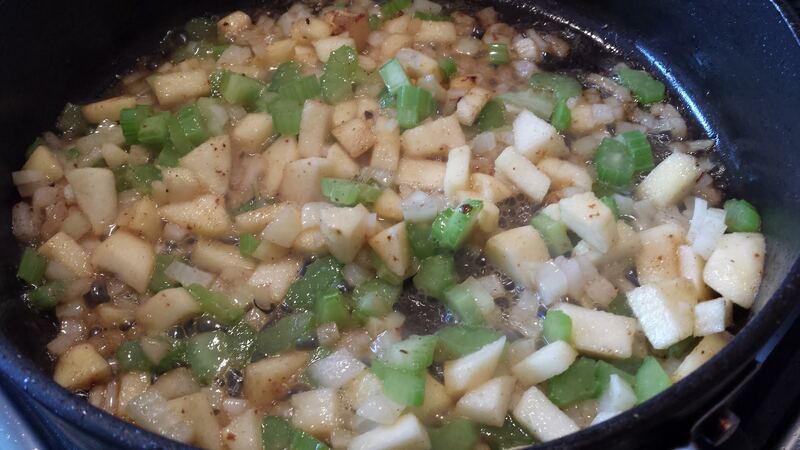 Add the apple wedges and fry over a moderate heat until brown and tender. Remove from the pan and keep warm. 7. Remove the cooked chicken from the pan and keep warm. Skim any excess fat from the cooking liquid. Add the crème fraiche, stirring, and bring to the boil and boil for 4 minutes, or until the sauce will lightly coat the back of a wooden spoon. 8. 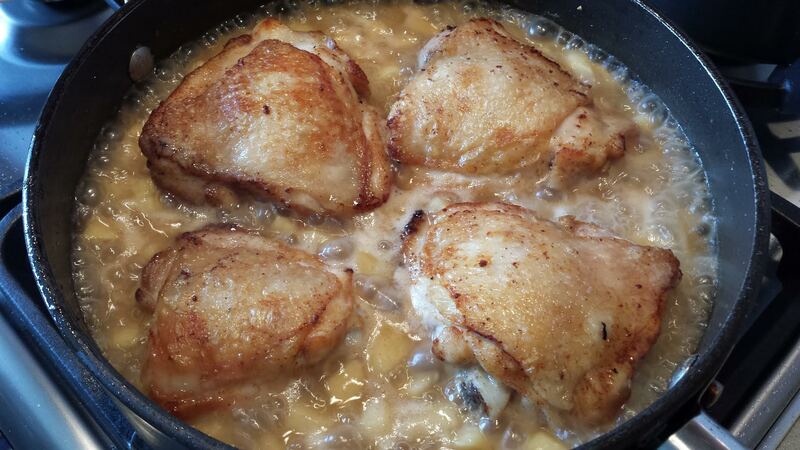 Season and pour over the chicken, and then serve with the apple wedges.